You’ve probably heard the myth: Coca Cola invented Santa. He’s a puppet for their nasty corporate agenda, and his primary job is not to deliver presents… But to sell sugar-laden beverages to the youth of the world! We do like to debunk a myth when we see it, so here we go. No, Coca-Cola did not invent Santa. They didn’t even invent his red suit, as is often claimed. This article guides you through the Santa marketing myth and marketing magic… Which could have unexpected returns for your brand in the next festive season! So, back to the Coke myth. 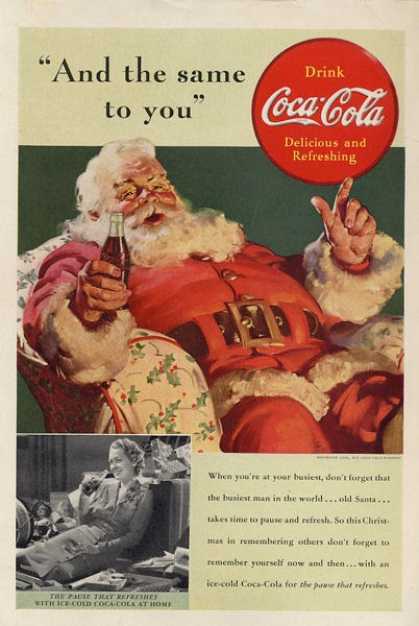 The fizzy drink giant started using Santa in its ads around 1920. By 1930, he was a popular, even emblematic, figure in their campaigns. And yes, this is Santa as we now know him: rosy-cheeked, jolly, with a fur-trimmed red hat and coat. But they weren’t the first to advertise using this version of Santa! They weren’t even the first soft drink company! In 1915, White Rock Mineral Water used a very familiar image of Santa in their Christmas Campaign. No red coat, though– the image was printed in black and white. Here’s another: all the way from 1908– a very long time before Coke got involved. Maybe Santa is a little more blood orange than red in this Victor Talking Machine ad, but he’s there nonetheless! Coke’s illustrator was Haddon Sondblom, and his images of Santa Claus are some of the most influential. But he drew from an image of Santa established by Thomas Nast– an influential caricaturist working in the latter half of the 19th century. So, if anyone can claim to have invented modern Santa, it’s Nast. Not Coke. But it’s understandable that people fall back on that popular myth. Coca-Cola is such an iconic, enduring brand, after all! And, thanks to Coke’s massive brand audience, they undoubtedly helped popularise this Santa’s image. Now, everyone’s using this Santa. Shopping malls use Fake Santas as draw cards for families with kids. The International Council of Shopping Centres has some stats that prove Santa’s effectiveness here. They tell us that 50% of shoppers with kids under 12 will make a visit to the centre with the intent of visiting Santa. And that exchange in itself is valuable: you’ll fork out for that photo of your kid perched awkwardly on Santa’s knee. Even if it’s motivated by a ridiculous tradition, or just plain nostalgia. In fact, there is a whole Santa industry that has sprung up around this figure. There are talent agencies that exist only to provide for Fake Santas for these occasions. And get this: Santas with real snowy-white beards are a special commodity. And postal companies make their cash this way, too. Send a letter to Santa! And pay the cost of the stamp, please! You know they’re not really sending it to Santa, though… We did some snooping and found out that Australia Post only charges the price of a local stamp for their Letter to Santa service. So, unless they’re copping that extra delivery charge to the North Pole, they’re not really sending it to Santa. Of all the exploitation of Santa for marketing, this disgusts us the most. Google, too, uses its Santa Tracker to expand on its brand experience and has done for 12 years. Check out the article we wrote on Google’s Magic Brand Lands here! Taking advantage of the holiday season to further your brand doesn’t mean you need Santa in your slogan. But it does mean you need to know what drives you customers. And if you customers love the fantasy of a mystical gift giver from the North Pole… It’s time to get your merry marketeer on!